The news is full of allegations of strikes against foreign workers. 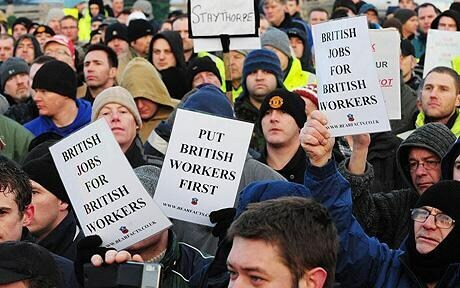 This is a misrepresentation of the facts, if not some of the sentiment expressed on placards that have quoted Gordon Brown's words in his 2007 speech to Labour Party conference, his first conference as Labour leader, where he uttered the phrase "British jobs for British workers". EU law allows for the "free movement of labour". Many Britons of course work in the EU and have benefited from this provision. Likewise many skills shortages have been filled in the UK by EU workers. While many conceive of this on an individual basis of European workers able to seek work without discrimination across the continent, in fact there is the power for EU firms to export entire workforces across the continent. Is this a socially progressive statute? I would argue not. A legal verdict in 2007 sanctioned the right of a company using foreign labour for work in another EU country without observing local pay rates. The right to free movement of labour in the EU is increasingly therefore a right for companies to freely move labour around the continent. While companies have always relocated across the world to cut labour costs, now they also have the right to move labour across the world to reduce labour costs. This is a right for big business not people. The 2007 EU Court's decision in the Laval case allowed a Latvian company renovating schools in Sweden to bring in workers from Latvia and pay them at Latvian rates. Of course no one has actually seen the terms and conditions of the Italian workers at the Total oil refinery in Lincolnshire, as the figures are "commercially confidential". But the suspicion is they are being paid less, which is probably why the Italian company won the contract. While there is nothing progressive about sloganising "British jobs for British workers", there is nothing progressive either about the EU law in this matter. As the left, we have to come up with a progressive solution that protects workers of the world. Neither the Gordon Brown parroting the BNP (from whom he stole the phrase) nor the EU offer us a solution. The Convention of the Left recall conference in Manchester on Saturday, January 24 “Capitalism Isn’t Working – what is the alternative?”, met in the shadow of confirmation that, after six months continuous contraction, the UK economy was officially in recession and heading in the direction of depression. As more than 180 delegates and individuals gathered - socialists and anarchists, trade unionists, environmentalists, democrats and those who favour direct action - they were confronted from the outset of the discussion with the global economy in free-fall. The sudden sharp economic downturn since the September Convention, and a succession of failed bail-outs, served to dispel the myths of a stand-alone crisis in the financial sector that could be resolved by a new regime of regulation and a programme of government spending funded by increased taxes, and ever more debt. News that car production in December had fallen to half the output one year earlier and Honda had doubled its two-month UK shutdown added to a mounting sense of the possibility of recession giving way to a complete economic collapse and gave a new urgency to a vigorous discussion, which I introduced on behalf of LEAP. However carefully prepared, many proposals crafted in advance proved inadequate for the sudden and sharp deterioration. Almost as quickly as they were raised, calls for pressure on New Labour to pursue a growth agenda, for previously radical-sounding programmes of demands to nationalise the banks, to build resistance to job cuts, for a Green New Deal, for doubling of jobseekers’ allowance and slashing rents, all began to look too weak for the new turn of events, on a scale unprecedented, and therefore unexpected by most. As the oil price plummeted to new lows, undermining the campaign for a windfall profits tax on energy companies, much of the discussion on the climate crisis revolved around the TUC’s proposals for a Just Transition and how to resolve the conflicting objectives of solving the energy crisis by preserving and creating jobs in coal and nuclear power, whilst moving to a low-carbon economy. As the day progressed, stronger, bolder proposals began to dominate, coming together in agreement of the need for a coherent strategy to establish a socialist economy. Beyond fighting to preserve jobs and hence the employment contract, which is being broken everyday as redundancies accelerate, ideas for were put forward for extending existing forms of collective ownership and creating new ones, based in the communities. Suggestions like using unsold Jaguar/Landrover vehicles as the basis for community transport came together with the necessity not just to oppose the global corporations, but to transfer their resources and those of the privatised bus, and train companies into socially-owned enterprises, democratically controlled and managed by committees of workers and transport users. The Convention’s own open democratic processes were tested and survived a challenge to its stated policy of broad and inclusive unity rather than campaigning for a new party. A vote to move on from a short discussion about the idea of a new party was carried by more than two to one. A new steering group was elected with nominations from a range of organisations, and strengthened by a new sense of direction, the Convention decided to invite the absent cooperative movement to join the group. The Convention provided a timely and valuable opportunity to bring together a wide variety of previously disparate strands. Hopefully, it will be followed up and developed through local Conventions. There may be no escape from a return to a higher, state funded pension. Earlier this week, the National Pensioners' Convention issued the following press release - and it seems points one and two are happening while, almost inevitably, the Government is doing nothing to protect people from this crisis. Britain’s biggest pensioner organisation, the National Pensioners Convention (NPC) has called on the government to strengthen the state pension system in light of reports casting doubt on the future of decent company pension schemes. The call comes as the National Association of Pension Funds is expected to announce on Monday (Jan 26) that 25 major companies will close their final salary pension schemes to existing members, and replace them with less secure defined contribution (money purchase) schemes. The NPC is calling for the state pension to be set above the official poverty level of £165 a week for all men and women and linked to earnings or prices (whichever is the greater). Official figures published today confirm that the UK is in a recession, following sequential quarters of negative growth in the UK economy. The economy shrank by 0.6% in the quarter to September, and by 1.5% in the quarter to the end of 2008. The latest figures represent the biggest quarterly fall in the UK economy since 1980. "The Government has consistently failed to recognise the seriousness of the plight of the UK economy and has consistently failed to recognise the need for radical measures to tackle the crisis. "Today's figures not only confirm a recession, but point to a depression - especially in light of the Government's failure." "The UK economy is now in freefall. This is more than another recession, it is the collapse of the neoliberal capitalist model that Brown told us to be evangelical about only a few months ago. "Simply bailing out the banks again and again shows that the Government has completely failed to appreciate the scale and the nature of the current crisis." Unemployment figures released today show that more than 1.92 million people were out of work by the end of November 2008. This figure is the highest since the year Labour came to power in 1997. "On this basis, unemployment today is over two million. This is a depression not just a recession, and the Government's measures have failed to protect people and preserve their jobs. "A lack of planning and radical action makes it almost inevitable that unemployment will hit 3 million with the consequent human suffering." "The remorseless rise in unemployment continues and looks set to accelerate sharply in 2009. In addition to the job cuts, workers are seeing their pay squeezed. Average earnings growth slowed again in November to 2.7% y/y, the lowest increase since February 2003, and well below the headline inflation rate of 4.1% for that month. Real earnings continued to fall". "And the recession continues to take its toll on the public sector finances, with the current budget deficit rising from £25.9bn in the year to November, to £33.3bn in the year to December. The rate of deterioration in the deficit number is accelerating." "Every week tens of thousands of people are being thrown out of work due to a crisis not of their making. The Government's response to threaten more sanctions against lone parents, the disabled and the unemployed is heartless when billions are being passed to bankers. "The current level of Jobseeker's Allowance - £60 per week or £3,000 per year - is a national disgrace. LEAP is backing the TUC campaign to raise JSA by £15 per week". Both John McDonnell and Andrew Fisher were signatories to a letter in today's Guardian, signed by a range of trade union leaders and welfare campaigning groups calling for a rise in JSA of at least £15. UPDATE: Labour MP Lynne Jones has tabled EDM 543 'TUC Campaign to increase Jobseeker's Allowance' based on the Guardian letter. Please lobby your MP to sign. Unemployment to hit 2m today? If, as expected, unemployment rises to around 2 million today, many of the newly redundant workers will be shocked to discover the low level of benefits in the UK. A single person over 25 years old receives £60.50 per week, dropping to £47.95 for those under 25. The UK is near the bottom of the western European league table in comparative rates of unemployment benefit. The gap between benefits and earnings has widened significantly over the past 30 years because jobseeker's allowance (JSA) has increased at a rate below inflation. If it had increased in line with earnings, an unemployed person would receive in excess of £110 per week. Politicians and government advisers argue that higher benefits would be a disincentive to work, but a wealth of evidence suggests that the descent into poverty has been a greater cause of economic inactivity. Benefit rates must be high enough to allow people to live a healthy lifestyle for physical and mental wellbeing. To achieve this, our long-term aim must be to substantially improve the miserly rates paid at present. The government has rightly made a priority of increasing demand to maintain employment at as high a level as possible, and recognised the importance of measures that will have a speedy impact. Unemployed people, because of their low benefits, are particularly likely to spend any increases they receive as soon as they receive them - pound for pound, raising JSA levels will do more to fight off the recession than any other fiscal stimulus. This is why the TUC has called for the government to respond to the lengthening dole queues by urgently raising JSA by £15 per week. We echo that call as the first stage of bringing dignity and respect to those thrown out of work by an economic crisis not of their making. No more bailouts, nationalise now! Today the Government announced a further 'bank rescue plan' - yet there are pigeon steps towards a more interventionist role: 'nationalised' Northern Rock to expand lending, rather than winding down and repaying its loans. The Government has also now taken a 70% stake in RBS. As the Government announces yet another rescue plan for the banking sector, LEAP makes one simple demand: nationalise the banks now and use them to help resolve the crisis, rather than continue exacerbating it. "Again we see the Government pouring public money down the bottomless drain of the banks. "Anger is mounting about the dithering and delays as the Government skirts around the only solution: to nationalise the banks in order to develop and impose a new banking strategy in the long-term interests of the country - rather than restoring the opportunity for another round of speculation and profiteering." "The Government cannot continue to bailout the banks, while the banks continue to turf people out of their homes and out of their jobs. Restoring people to their jobs and housing is a more urgent priority than restoring bank profitability." "The only solution is nationalisation of the banks and the Government seems only to be edging at a snail's pace towards this realisation." Figures released later this month are expected to show that unemployment has breached two million. Almost every day so far this year hundreds, if not thousands, of job cuts are announced by UK companies. Youth unemployment is at its highest level since 1995. At the end of the month, Government figures will also show that the UK is officially in recession. Manufacturing is declining at its highest rate since 1980, down by 2.3% in the last month and by 5.5% over the last six months. The annual rates of decline accelerated to 7.4% and 6.9% for industrial and manufacturing output respectively. Even the weakened pound is unable to aid UK exports. Tomorrow lunchtime, the Government will unveil its Welfare Reform Bill threatening workfare, cutting entitlement for lone parents and privatising yet more of Jobcentre Plus and welfare provision. Despite the fact that there are 1.86m unemployed (at the end of October) and less than 400,000 vacancies, apparently more lone parents and disabled people need to be forced back to work with the threat of sanctions for non-compliance. Thankfully there is growing opposition to the Government's welfare proposals. The Government is floundering. It has no idea how to deal with this crisis, because its guide - neoliberal ideology - has no solution. Let's make it a new year resolution to all unite for a socialist response to the crisis. If we don't, we will all suffer. Barack Obama yesterday raised the spectre of an irreversible crisis, with the situation getting “dramatically worse”, if his spending plans to boost the US economy were delayed. Is he being alarmist? And will his plans for a $775 billion “shock therapy” package work? How can we assess the likely success of these and related measures being proposed by governments around the world? Estimates of the extent of the financial and economic crisis have varied widely, continuing to worsen since the sub-prime mortgage default problem first began to make its appearance in the spring of 2007, an early but ominous sign of something far deeper. One closely-watched indicator is the Bank of England’s base rate. Yesterday the BofE cut its rate yet again, one of the other strategies being deployed to prevent the rapidly deepening recession turning into an economic catastrophe. Now at 1½%, less than a third of its level only three months ago, the rate is lower than at any time since the Bank’s foundation in 1694. It is expected to go lower still. People with savings and pensions have already seen the income from their investments drop by more than half. On this measure, the turndown takes the economy back to the beginnings of the epoch of capitalist production. The nearer it gets to zero, the more certain is the resort to printing money, and a further devaluation of currencies already weakened by the implosion of fantasy finance. Retail giants are shrinking and closing as sales dry up. The roll call of historic names lengthens day-by day. Nissan in Sunderland, widely regarded as the epitome of efficient modern car plants globally, announced a cut of 1,200 jobs, nearly one in four of its UK workforce. This is just a part of Nissan’s response to demand which has fallen by 25 to 30% already, pushing its stocks of unsold cars to 93,000 in Europe. Estimates put the knock-on effect locally as high as a further 20,000 jobs. Nissan’s workers will not trust Lord Mandelson’s pledge to help then find new jobs as quickly as possible. As for their union “leaders”, Unite union joint general secretary Derek Simpson’s offered no resistance, saying pathetically: "The economy will improve and, when it does, Nissan will need these workers' skills again.” Thank you and good night. The lesson from Obama’s warning on one side of the Atlantic and the flurry of government activity on this side, together with the virtual elimination of interest rates, is that the system is broken at every level and it shows. The US government’s spending deficit is already running at $1 trillion, for example, even before the president-elect’s package is added on. There is, unsurprisingly, a growing reluctance by foreign investors to deposit funds in either the US or UK. If the banks can’t and won’t make credit available, if production is being slashed because consumers can’t and won’t buy unnecessary commodities, then clearly there is something fundamentally wrong. In this context, “stimulus packages” make no essential difference. The alternative is to seize the banks and the corporations, keeping people in their jobs and homes, pending the reorganisation of the economy on rational, not-for-profit, co-operative lines, producing sustainable goods to satisfy social needs. At least we would then have a measure of control over events rather than being passive victims of the unravelling of the capitalist market economy. Neither Obama or Brown will do any such thing, of course. They will use the capitalist state to try and save capitalism at our expense. Therein lies the political challenge. . . .The Government must now nationalise the banks . . . The Monetary Policy Committee of the Bank of England will decide later today whether to cut interest rates further. The decision is expected at about midday. LEAP is arguing that the Government must stop dithering and should nationalise the banks. "In this crisis, the Government and the Bank of England have consistently been behind the curve. The Bank of England was slow to cut interest rates and the Government's fiscal stimulus was pathetic. "The quantitative easing has been delayed and ineffectual, and the Government is now dithering over the necessity of taking control of bank lending and borrowing. The country cannot wait any longer, we have had nine months of indecision." "Whatever decision the Bank of England makes today will be largely irrelevant. "Until the Government takes control of the banks this crisis will continue to grow - meaning more bankruptcies, more unemployment and more repossessions."